The Kramer XGA/Stereo Audio/Bidirectional RS-232 over Twisted Pair Transmitter sends computer graphics video up to WUXGA/1080p, unbalanced stereo audio, and bidirectional RS-232 control command signals via a twisted pair cable. When used with the TP-126-od twisted pair receiver, the transmitter provides a transmission distance of more than 300’ (91.44m). It allows you to check the status requests and control of the destination unit via bidirectional RS-232 signaling. 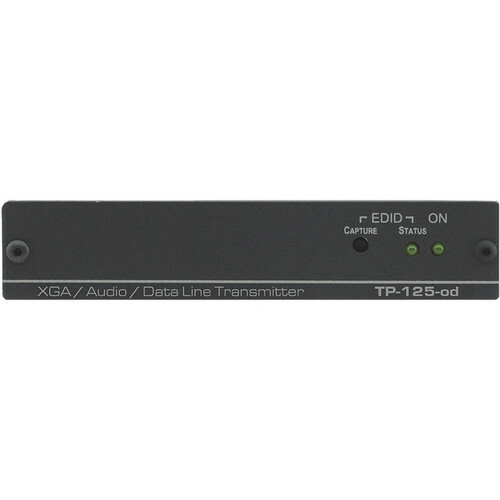 With EDID capture, the XGA/Stereo Audio/Bidirectional RS-232 over Twisted Pair Transmitter copies and stores EDID information and avoids compatibility issues with the connected display if any in the future. Via EMP protection, it offers protection against voltage surges induced by electromagnetic field of a nearby lightning strike. However, it does not protect against direct lightning strikes. The XGA/Stereo Audio/Bidirectional RS-232 over Twisted Pair Transmitter requires a 12V DC power supply (included) for operation. Power Connect System allows both the transmitter and the receiver to be powered with a single connection when the units are within 150’ (50m) of each other. In addition, 3 units can be mounted side-by-side in 1U rack space with the optional RK-3T rack adaptor.